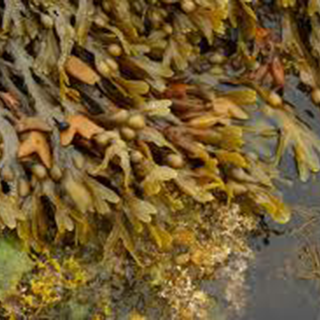 Bladderwrack or Kelp is cool-water sea vegetable that absorbs large quantities of minerals from the sea. Containing significant levels of iodine - the mineral most responsible for stimulating thyroid gland function. Bladderwrack has traditionally been used as part of a weight-loss regime. Take at the manufacturer’s recommended dosage. 3–7.5g a day, or max. 50g (2 oz) per week with 1 cup boiling water. To encourage the elimination of toxins from the body, nutrient-rich bladderwrack is combined with cleansing sea salt, fennel and celery seeds. Make an infusion with 2 cups of water, 1/2 tsp bladderwrack, 1 tsp celery seeds and 2 tsp fennel seed. Add 2 heaping tsp sea salt to the infusion and stir until well dissolved. Use immediately, adding it to a freshly run bath.